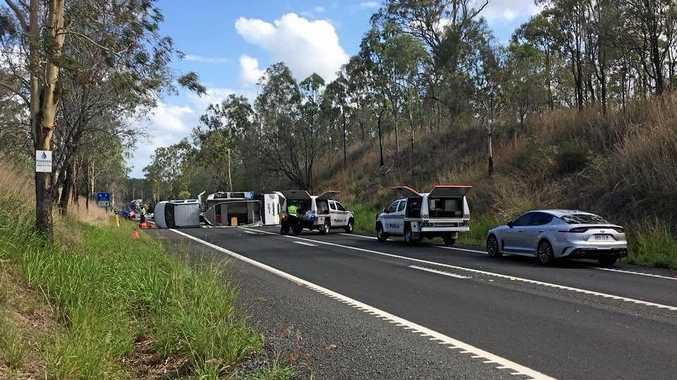 A MAN aged 20 has died after a two-vehicle crash on the Bruce Highway at Miriam Vale on Saturday morning. Police said a sedan and a small truck towing a caravan crashed head-on 38km south of the township at 11.10am. "The driver and sole occupant of the sedan was pronounced deceased at the scene," a police statement said. The occupants of the other vehicle, a man and a woman aged in their 60s from Glenella, received minor injuries and were taken to hospital. Both sides of the highway were closed for most of the afternoon and evening. Traffic was backed up for more than 5km from the crash. Police set up diversions around the site, with traffic redirected to Fingerboard and Tableland roads. The highway was reopened at 7.30pm and the Forensic Crash Unit is investigating. If you have any information for police, including dash-cam footage of the crash, contact Policelink on 131444.